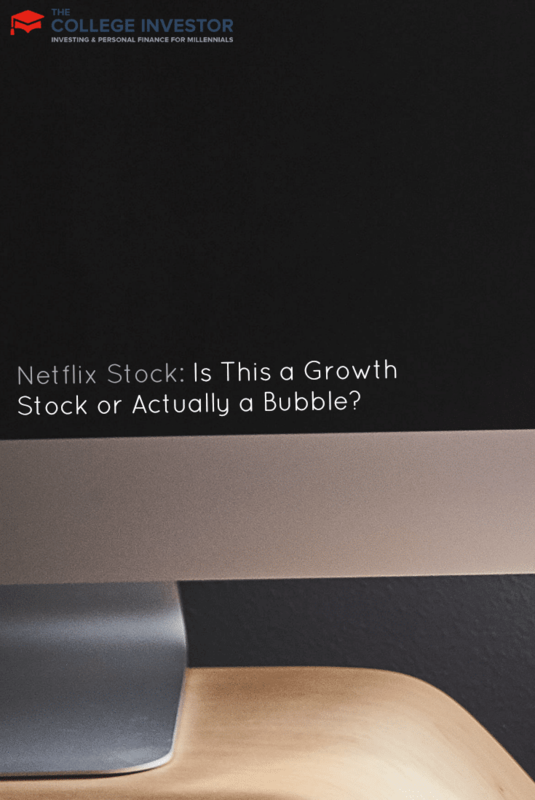 Netflix Stock: Is This a Growth Stock or Actually a Bubble? 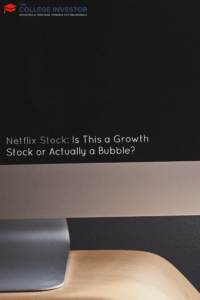 Home » Netflix Stock: Is This a Growth Stock or Actually a Bubble? After a very strong year, Netflix, Inc. (NASDAQ: NFLX) has seen its share price surge over 250% YTD and over 445% in the past 12 months as of today, positioning itself as the fastest-growing stock in the S&P 500. What’s more, if you had invested $10,000 in Netflix five years ago, your stake in Netflix would be worth over $163,000 today. Carl Icahn famously invested in Netflix back in 2012, but it was disclosed in a regulatory filing on October 22nd, 2013 that he had just sold over half of his stock at a gain totaling roughly 460%. Some have said that Icahn’s very profitable Netflix investment, which reportedly netted him around $800 million, was one of the best trades of all time. But even so, what does the future hold for Netflix and is the stock still a viable investment opportunity or is Netflix the most absurdly-valued stock of all time? Founded in 1997 by Reed Hastings, Netflix offers online streaming services to paying subscribers, allowing them to watch TV shows and movies on the internet as much as they want. Customers around the world can access their content from their computers or via their mobile devices. U.S. customers can choose to receive DVDs and have them delivered directly to their doors. The business model is straightforward: source content (through licensing, revenue sharing, and outright purchasing), present it through a user-friendly platform, and charge for the service. Customers are attracted through the internet, TV, and radio. As a result, Netflix has managed to become a household name. The company has built up a large user base with more than 33 million global subscribers in 2012 and more than 40 million today. Revenues have increased each year from 2010 to 2012. Total revenue reached $2.2 billion in 2010, $3.2 billion in 2011, and finally $3.6 billion in 2012. 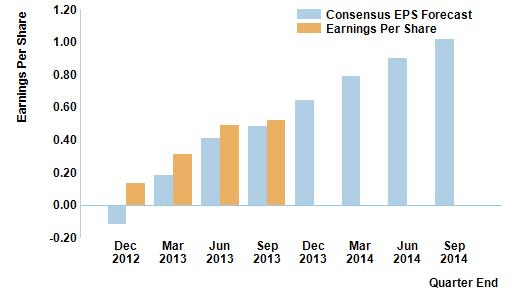 Netflix has also managed to beat the consensus estimates for their EPS (earnings per share) figures every single quarter for the past four quarters. In early 2013, the company became the original broadcaster and distributor for House of Cards, which certainly helped Netflix to beat the earnings estimates. International expansion has been a major source of growth for the company, adding a further 1.4 million subscribers overseas in Q3 2013. Netflix is clearly an impressive company and is likely to release more original content, expand further internationally, and seal more rewarding partnerships and joint venture deals with other companies. Hastings, the founder who also serves as the CEO of Netflix, recently expressed interest in getting into cable which could well present even more growth. Just by looking at other companies in the same media industry, you can see that there is indeed still room for growth. Comcast Corporation (NASDAQ: CMCSA) has a market capitalization of over $125 billion today, with Time Warner Inc. (NYSE: TWX) at almost $65 billion and DIRECTV, LLC at roughly $34 billion. Netflix has a market capitalization of “just” $20 billion or so as it stands. The current valuation is still worrying though, in fact even Hastings has said so himself. Even if the company can continue to grow aggressively, the problem with jumping on this stock right now is that Netflix really does need to perform, as analyst expectations are ever-increasing. The company keeps outperforming quarterly consensus estimates, but who says it will be able to continue doing so? Many have described the stock as a bubble, a self-fulfilling prophecy where people are buying into the stock just because everyone else is. While the media companies listed above have larger market capitalizations, they also have much smaller PE (price/earnings) ratios, ranging from 13 to 25 in the year of 2012, whereas Netflix achieved an alarming PE ratio of almost 1,140 in the same year. High PE ratios are common in fast-growing technology stocks, but they don’t last forever. HBO is said to have around 114 million subscribers and is owned by a subsidiary of Time Warner. This is what Hastings wants its investors to focus on, rather than the share price. Netflix’s major competitors, as listed in its 2012 10-K, include Prime Instant Video from Amazon.com, Inc. (NASDAQ: AMZN), Hulu.com (and Hulu Plus), and LOVEFiLM among others. Netflix does seem to have the stronger position in its niche, but it still has its competitors who are constantly innovating and improving, so they do bring a level of risk to the table. If you have been holding the stock for a few months or even for a few years, you will have enjoyed great gains on your initial investment and will of course be pleased with your decision to invest in Netflix. But should you continue to hold the stock? In the short-term, there could be some more potential upside. Since the company still has some upside potential with new ideas and initiatives for expansion, with the stock continuing to generate attention and buzz, the share price could potentially continue to climb. However, if you want to be safe, it would be best to lock in your gains now and close your position in Netflix. In the longer-term, the company could well prosper furthermore but the stock price has a lot of potential for a correction, meaning it stands a good chance of cutting back. It is obviously difficult to predict, but selling now like Icahn might be a good idea for most investors in order to preserve your impressive returns. Even if the company managed to seal some fantastic content partnerships, presented wider offerings to its customers, and saw even more rapid expansion of its user base, the stock price is still not guaranteed to climb. Tread carefully and shy away from buying simply because everyone else is. As a speculator, the same applies. Money can be made in the short-run with many stocks if you can make a good entry. But you want to avoid getting into a stock too late and being punished by any kind of correction. Your own analysis, risk tolerance, and overall rationality will ultimately guide you though. Netflix is certainly not a stock for the conservative investor who is transitioning into a hopefully stress-free retirement. Interestingly Carl Icahn’s son, Brett Icahn, came up with the Netflix investment idea originally and still believes the company to be undervalued. If Brett is right, it would be unwise to expect just as crazy returns as Netflix has seen in the past, but there could still be some upside potential in the company after all, for those investors who have decided to arrive late to the party. It is now for you to decide who you think is right, as the individual investor: Carl or Brett. Are you still buying into Netflix or selling Netflix?